SOLD — Kurdish Tribal Bidjar Rug from Iran — 8 ft. 5 in. by 4 ft. Very heavy handmade runner from northern Iran. Dazzling colors across a dark field (nearly black), a central medallion and two wing medallions in navy blue, red lions, botehs (the figures that look like floating amoebas), and wide violet – rose borders. Stylized tree-of-life motifs. These rugs are believed to symbolize the royal Persian courts of antiquity. Lions, of course, are associated with Persian history and royal leadership. Very good condition with minor wear. Woven by Kurdish or Azeri village weavers on a home loom. Generally sold as Bijar rugs– which are dense, heavy rugs created by Kurdish weavers in western Iran. 1960s. The boteh design originated in Kashmir, migrated into Persian rugs several centuries ago, and eventually was copied by the British textile industry to become known as Paisley (after the Scottish town where it was produced in large volumes). 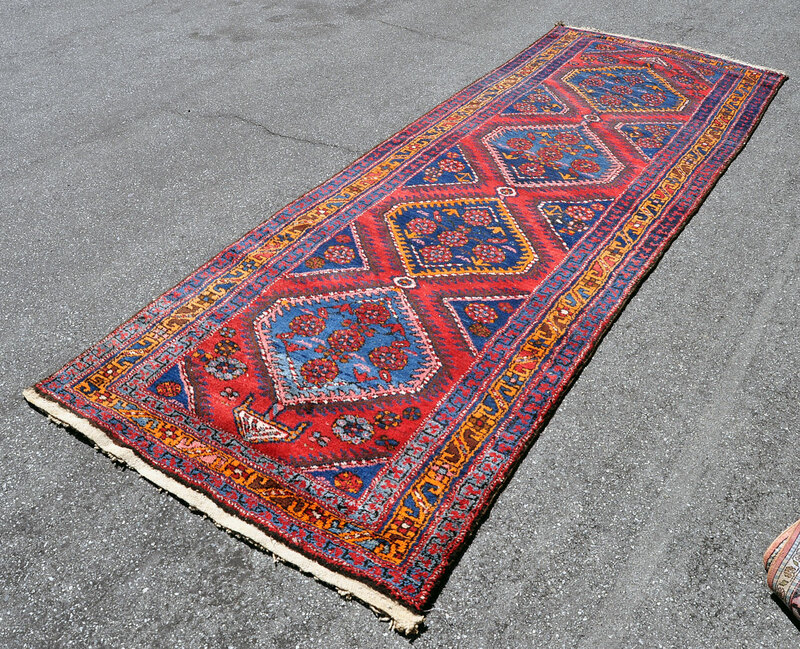 The boteh remains an important design element in many Persian rugs. Exact size is 8 ft. 5 in. by 3 ft. 10 in. Natural wool woven onto cotton. Quite dense and heavy. Very good choice for high foot traffic area as it will not shift around as some carpets will if walked on vigorously. Price is $475. Shipping $55 (very heavy rug). Or free local pickup. Vivid geometric tribal rug with red, blue, green, ivory, orange and black in a dazzling array around triple medallions. Expansive size at 12 ft. 7 in. by 5 ft. 3 in. — and 100 % natural wool. North Persian Kurdish or possibly Azerbaijan. Side cord is more like a Heriz or Sarab but the rug is all wool, and generally weavers use cotton for the warp in those areas. 1960s. Some light wear and color abrash (variegation in color due to different dye batches). Faint fugitive dye in parts of the fringe. Fairly heavy rug but a softer weave so might not be perfect for a high foot traffic area. A simple mesh pad would help to hold it in place on slippery wood or tile floors. Fantastic village rug — out of my personal collection. Mind altering art for your floor! Price is $695. Shipping is $49 with free pickup an option.